Image By Sukaina Rajabali. Recipe from "Food, Love and Life in Dalia's Kitchen"
I wish there was a prettier reason for me having to be in bed, but alas, I caught a severe tonsillitis that caused dehydration, which led to exhaustion. I'm completely ok now, but no, not my funniest weekend. It all started out with Phares turning two last Monday. As much as I love this age of new discovery and character, I was crying my eyes out the last night of him being one. Time simply flew by too fast. Phares will never be this tiny again, and inshAllah grow up to be a happy, healthy man, but knowing that he says "thank you" instead of "teng teng" now, and that he has become this little person who knows what he wants now, made me realize that he's just not going to be my baby forever. And that of course made me very sad/happy. I guess that some part of this sadness is also related to me being a working mommy, and maybe I may have missed too many of the "teng teng" moments, or could I even ever get enough of these "teng teng" moments? I'm not sure. After a very last minute, cozy birthday party, Phares did not feel well. I wasn't sure if he just had too much cake initially, but once he ran a fever, something was up. He wasn't well for a few days, but hamdellah, nothing too bad. And then I got sick. So since I can only have soups I thought I would post the one, which brought me back to life these past few days. 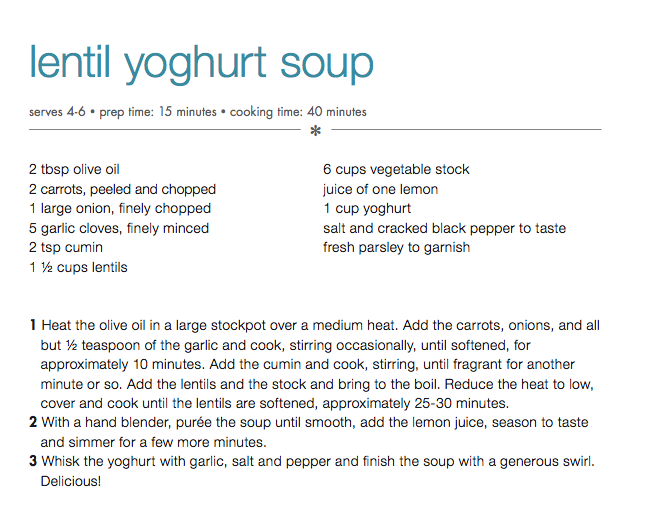 My famous Lentil & Yoghurt Soup that is also in the cookbook. 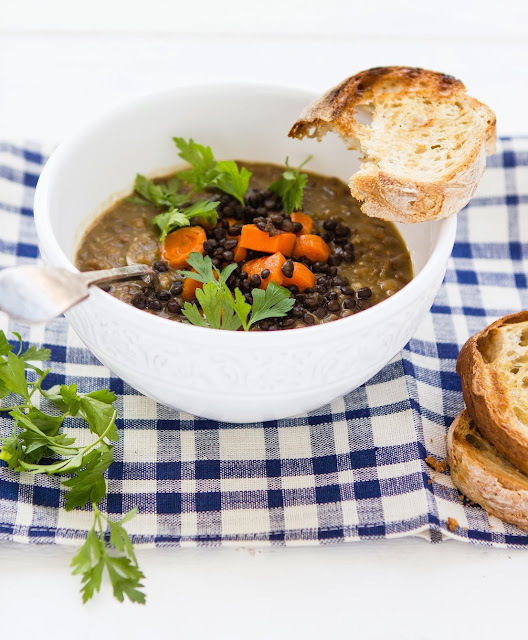 There simply is nothing like lentil soups to get you back on track. The fact that it is absolutely delish and is by no means a "sickly soup" makes it all even better. Lentils are rich in iron, and believe it or not I went from feeling lifeless to not so terribly sick within minutes. Truly!